Unicorns are a diverse equine species that comes in every natural horse color, as well as unusual and unnatural colors, with markings that may border on the extreme. Split into four distinct variants, they are spread throughout the Realms, and are known to be adept at both magical and physical combat. However, unicorns as a whole are a somewhat mysterious, peaceful breed; their herds will only fight when needed, and only for what may be important to them. Horn Types Horn types vary with what breed holds them, but can vary greatly in each of their variants. Anything from the traditional spiral to curved, bladed things are common, and other shapes - such as single antlers, long spikes, blunt nubs and similar things- have been reported. Loss of a Horn If a unicorn of any breed loses their horn, they will be unable entirely to summon more than rudimentary magic until their horn grows back in full. Magical exhaustion and overtaxing becomes very dangerous and common in unicorns who have lost their horn, and they may become depressed and leave their herd out of humiliation. Many unicorns die this way, alone and hornless, as any predators know that this is when they are at their weakest. Unicorn Hybrids Rarely, the different unicorns will interbreed if herds cross paths, or solitary unicorns travel together for a time; some herds detest hybrids and will not allow them to stay beyond their first few years, while others do not mind at all. Some hybrids band together with other hybrids, though their herds are rarely seen. Lizzarkythian Gemstones At one year of age the gem of a Lizzarkythian is awoken, revealing its true color. These indicate a unicorn's true elemental alignment and are most commonly a ruby, sapphire, emerald, aquamarine or topaz. However, a variety of other types have been recorded with various degrees of rarity, all listed below. Those in italics are in order from uncommon to extremely rare while an underline indicates the gems which only appear in times leading up to a great need. These come in pairs - one of each - and only a single pair can exist at one time. False History Lizzarkyth legend claims that all unicorns are descended from the ones of their Realm, even though this has been proven to be untrue. While it does seem possible that the Felnovian unicorns, with their large variety of colours and lack of jewels, could be the progenies of their cousins, it has been discovered that it is, in fact, the reverse. Denizens of Lizzarkyth, however, refuse to believe this as fact. Species info credited to Aehryn, Blazeh/Verridith, and Daweia. Appearance Unicorns in the Realms are creatures that have evolved, over time, from the first unicorn that was changed from an auroch by L'zayn. All unicorns are quadrupedal equines with a single horn atop their heads, adapted to the most hospitable environment available to them per Realm. Most concentrations of unicorns seem to be in Evylon, Felnova, Millirand, Ristell, and Xaeri, though solitary individuals and small herds can be found everywhere. Below are the attributes for the various types and where they commonly dwell. Desert: Found almost exclusively in Ristell's Arcadian desert, and said to be one of the most beautiful unicorn breeds, the desert unicorn is a delicately-built and refined variant that lives alongside the sol'tera nomads that dwell in the great sands. They typically have dished faces and ornate horns, large and expressive eyes, and flaring nostrils for better air intake. Most carry their heads and tails high, and have arched necks, and have been described as some of the most graceful creatures to exist in Ristell. They can come in any color natural or unnatural, and may get painted or tattooed by their sol'tera nomad neighbors. Forest: The forest unicorn is a medium- to large-sized unicorn with a long mane and tail, longer ears, and strong, varied horns. Though they can be found in any Realm, they are most common beneath the trees of Evylon, alongside the elves' various settlements. Their tails may appear as either traditional equine tails, or leonine, though will always be long of hair and soft to the touch. They usually range lighter in color, with darker eyes; dilution genes (such as palomino, cremello, perlino, etc), and the greying gene, is very common, as is true white. Black, and dark colored forest unicorns, are uncommon but not rare. Highland: Highland unicorns, often called mountain unicorns or Felnovian unicorns, are large, drafty equines with sharp horns, feathered* hooves, and long, leonine tails. Their hooves can be either wide, unbroken crescents or cloven, with a chestnut and ergot commonly found at the inside of the forearm and bottom of the fetlock no matter the hoof type. Highland unicorns can be found in any color, natural or unnatural, and have any possible marking; however, they have also been found to adapt lighter winter coats at extreme elevations. Eye color may also range widely, as does pupil size and shape. * not actual feathers, but long fur around the hoof! Lowland: Commonly referred to as the plains unicorn, though known throughout Millirand as the lowland unicorn, these are moderately-built unicorns with large horns and short, spiky manes and tails. Their horns are often quite ornate, but may be unsuitable for actual combat; though they hold extreme magical capabilities, they are the most fragile horns of the unicorn variants. They may come in any color, though natural hues are found most often - lowland unicorns do have the unique reputation for almost always having bright, intense, and bi-colored eyes. Culture Unicorns are traditionally a rather secretive race; they do not often intermingle beyond their herds in great number, though there are exceptions within the different breeds. Within a herd, the bonds are strong, and most unicorns become depressed and sorrowful when separated from their herdmates for long. Some may travel from herd to herd over the course of their lives, sharing experiences and companionship with a wide range of other equines; several unicorns of various types can be found in Millirand's Duscae herd, intermingling with other unicorns, equus, and other such creatures. Solitary unicorns enjoy the company of others, and may rarely bond with a rider - though most unicorns share a unique and gentle kinship with children, and will allow them to ride short distances on their backs. Desert: Desert unicorns enjoy the company of sol'tera nomads, those that shun the dense cities of Ristell for the wide, vast sands; some desert unicorn herds travel in tandem with the many nomad tribes. They have been known to initiate trades between tribes of sol'tera, prides of d'jini, and wandering keht'shu and sphinx; it's not uncommon to see a desert unicorn or two traveling with messengers between nomadic camps. Among other unicorns, the desert breed is generally spirited and arrogant as a whole, though exceptionally intelligent and cunning beyond that of even their forest, highland, and lowland kin. They are accepting of outsiders, and don't balk at sharing their magic with the worlds they live in. Forest: The most mysterious of unicorns, members of the forest breed rarely speak with outsiders who do not dwell beneath the trees as they do. Herds take great care to keep their history from all who seek it, and frown upon unicorns who leave the herd to take up solitary wandering. However, they enjoy the company of elves and fauns, and do not mind sharing space with centaurs and Evylonian deer, so long as they don't attempt to stir trouble within the herd. Highland: Proud and strong, highland unicorns dwell in small herd-groups of usually no more than five or six, led by a single boss mare and her favored stallion. Hardy and enduring, these small bands travel the most difficult portions of the mountains with ease, and rarely come down except to trade with other species for various things they can't craft with hooves. They are known to regale travelers with tales and legends of the area, especially of their own exploits, often to the detriment of time for any caught in their stories' web - for leaving a highland unicorn mid-story is greatly frowned upon, and may win a challenge-duel of honor instead of a swift escape. Lowland: Lowland unicorns are known to be a flighty, if serene, breed; they often spook quickly at danger and shy at most large species that travel near their herds. However, once a lowland herd's trust has been won, they are exceptionally loyal. Some members of other species - including other unicorn breeds - are often accepted into lowland herds, and hybrids are never frowned upon for what they are. Because of this, lowland herds may become significantly large. Abilities A unicorn is a uniquely magical creature; all variants have magic to some degree, though magicless unicorns have been reported in very rare cases. They may have any elemental affinity or multiple, reiatsu control, and other non-elemental magic. Many may have a combination of abilities, both elemental and not, and unicorns are known to be significantly powerful mages. Each breed tends to have their own unique powers, as well - these are detailed below. Desert: Most desert unicorns have a unique affinity for speed; they are faster than other unicorn breeds, and can outrun and outperform most creatures across the deserts in which they live. They may also have an affinity for wind or lightning, as well as great endurance and stamina. Forest: Forest unicorns specialize in stealth and illusion; while nothing near the levels of a kitsune or dreameater, they may hide themselves well, and often weave intricate and multi-layered illusions around the youngest herd members. Some forest unicorns may have more of an affinity for nature and earth-based powers, as well as faun-like song. Highland: Dwelling upon the harshest mountains, highland unicorns specialize in defense and barriers over all other abilities. Most can generate magical shields from a very young age, and many highlands have a unique affinity for rock-based earthen elements. 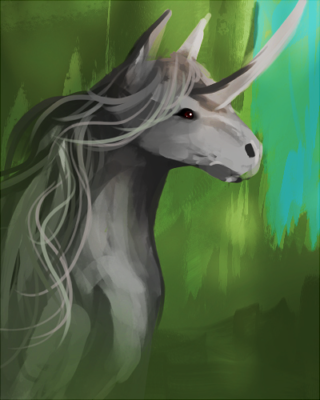 Lowland: Living amid plains and grasslands, lowland unicorns often have abilities focused on detection and sensory affinities, and most can 'see' reiatsu aura around living creatures great and small. Oddly, many lowlands have elemental affinities focused around fire and water - usually in very strong degrees. Creation Year: 652. Realm of Origin: Millirand. Deep beneath the stormy skies and away from Death's reign of terror fled L'zayn, alone; she settled in a crystalline cavern far from all, near a glowing pool that reflected the beautiful walls tenfold. In its light, the goddess looked at her reflection, and was surprised to see tears course down the sides of her cervine face; Death had separated her from her fellow gods, and for the first time in a millenia, she felt the touch of true despair in her heart. All they had been able to do was hide, run, and create in the hopes that, someday, he might be able to be destroyed. Most of their creations were strong, yes; but they were fleeting, or ungraceful. But it was not too late; no, it couldn't be. She knew what she wanted to create, and she stepped into the crystalline pool, dipping her muzzle into its glittering depths. Her tears slid down into the waters, and shone with golden light where they touched; each tear turned into a drop of glowing metal, sinking to the very bottom. As they fused with the crystal beneath, the waters began to bubble, and she stepped out and turned to watch, as form began to grow from the first, crystals rising above as the single tear split into two, shimmering as eyes in the glittering mass. Carefully, she shaped the form to have four strong legs, and froze the water dripping from it into long, hanging icicles; two ears she gave it, an equine head and neck, and a long, curved horn. Reaching forward, the goddess brushed her muzzle against the crystal-equine's, and its shimmering veneer shattered and fell away - it revealed a large, drafty equine creature with cloven hooves, a short tail, and a branching horn rising from his nose. You are the First Auroch, she told him, as he pawed and snorted; awakening his mind, she smiled, and let the others form into the rest of the first auroch herd. You will grant your strength and beauty to this land, and rule the forests and grasslands justly. For you are Auroch, blessed of L'zayn, and you are the beloved of the gods. To say L’zayn was displeased with the aurochs she had created would be a lie. On the contrary, she was greatly pleased with her creations. The power and majesty evident in their powerful forms, together with their seemingly timeless demeanor filled her heart with joy. But something seemed to be lacking, and Millirand was a new Realm. So she decided it was time for something almost as new to go with the new Realm. To that end, she took an auroch, lulled her into a deep slumber and refined her, doing away with the almost overwhelmingly powerful form of the auroch in favor of a much more lythe, graceful, equine shape. The heavy horn was refined into a long, slender one that gleamed like a crystal in the sun, and moved to between her eyes. The hooves shrank, but remained hard. The heavy coat shortened, and became more supple, and she was granted a long tail tufted at the end. L’zayn paused, and stood over the slumbering creature, the first unicorn, and spent several moments in deep thought. Then she knelt, and touched the unicorn’s horn with the tip of her snout. The horn briefly glowed with its own inner light as a bolt of magic flowed from the goddess to her creation, and the unicorn stirred, and awoke, rising gracefully to her feet. L’zayn bade her gaze into the nearby river so she could see herself, and she spent a long moment gazing at her reflection in wonder as the goddess departed, a soft, pleased smile upon her face. The first unicorn returned to her forest home, and was soon joined by others of her kind, newly created by L’zayn so she wouldn’t be alone. For though the two races still remained close, she was no longer an auroch, and the aurochs were not unicorns. Name: Erasmos. Location: sleeps within a hidden clearing in Xaeri's deepest forests. Status: Alive. The First Auroch is a large and powerful male with long fur and a strong build. His single horn is large and branching, erupting from his nose much like that of a modern rhino. His ears are long, but rounded, and can swivel back and forth in both expression and sound detection, with fluffy insides. Each cloven hoof is very large and thick, and the ground thunders beneath him as he walks, trots, and gallops. The thick fur that covers his body is in alternating shades of silver, white, and grey, shimmering with light. Erasmos is known to be a proud defender of any who is weaker than he; his wrath is one to shake Realms, and his fury is feared by all. He is arrogant and egotistical, seeing himself as above and beyond even the rules of gods, refusing even direct orders without power in their words. Classification: Twisted, demonic unicorn. Location: Anquil, Evylon. A scaled unicorn with large fangs and claws for hooves. Their horns are large and jagged, usually venomous, and their manes are thin and oily. Highly intelligent pack hunters, with strong magic of all kinds. Classification: Hornless unicorn; sentient, varied horse. Location: Abroad. An offshoot of the unicorn, the equus is a growing subspecies of unicorn without their traditional horn. Gifted with an extravagant range of physical appearance in colors, markings, and mutations, these creatures may range from the most normal-looking of traditional equine to a horse as brightly colored as any dragon, covered in feathers, horns, extra limbs, spikes, eyes, or a variety of extra features. Equus are very intelligent and often are quite gifted in magic, and live in intricate, complex herds or as individuals among other species. Herds of these equus have been found in nearly every Realm, and are fully capable of breeding with other equine breeds and races, including the traditional horses commonly found as mounts for humanoid riders. The equus began as a mutation of unicorn without their horn, and - cast out from unicorn society as a whole - took to finding others like to them, until herds led by strong and capable stallions began popping up all over the Realms. Now, they have become more common in the last thousand years of their existence, and the rest of the Realms has begun to take notice of them. Classification: hellish undead unicorns. Location: Hell. The nightmare and hellhorse are one and the same; they are separated simply by general temperament, and, of course, gender. They are created when a unicorn dies and is brought back to life; the spirit is corrupted, and the resurrection seems to fail. Instead, they are reborn in Hell as a dark-coated beast with longer, more jagged horns, sharpened, almost bladed hooves - be it cloven or single-toed - and their trademark feature, fiery hooves, manes and tails. The fire, as well as the color of their glowing eyes, reflects their inner aura and may be whatever hue their reiatsu is. When using whatever magic they may have had in life, it seems corrupted - light will be tainted with darkness, earth will be plagued with death, water will become poisoned and foul. Nightmares, the females, will be the less aggressive of the pair; hellhorses, though intelligent, have a tendency to make their attacks random and brutal. They can be tamed by very few and rarely escape their homeland, and few ever return to their previous ways. Classification: gemmed unicorn. Location: Lizzarkyth. While similar to their cousins in general appearance, the unicorns of Lizzarkyth nonetheless have a few distinct differences. They come only in shades of white and cream, ivory being the most common, and are often arabian-like in statue with cloven hooves and light feathering around their ankles. More peaceable than the Felnovian unicorns due to their sheltered existence in a Realm that sees no war, their horns rarely deviate from the traditional spiral, though the length and color varies with each individual. Perhaps the greatest difference is that each unicorn born of Lizzarkyth possesses a gem at the base of its horn, granted at birth but not woken until one year of age when the color is revealed. These gems serve to focus their magical abilities, often granting them far greater powers than those of Felnova; while they are able to perform magic without them, their aptitude is greatly reduced. Classification small, delicate unicorn. Location: primarily Xaeri and Evylon. 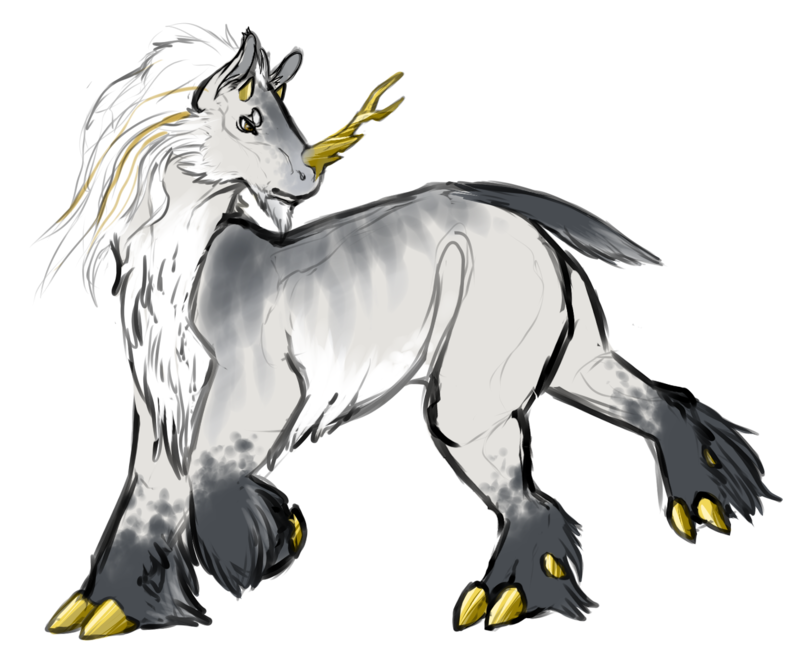 Rarest of the unicorn subtypes is the mel'au, a delicate and beautiful ancestor of both the Felnovian and Lizzarkythian breeds. Small, only able to grow to the height of a large dog, these unicorns live in the depths of old forests where few ever wander. They're noted primarily for their graceful, endearing looks. With thin spiral horns much longer than their cousins, they have cloven hooves tufted with thick fluff at each fetlock, and leonine tails tufted much the same. They also have longer ears and are built more like a deer than a horse, with soft, large eyes. Their coloration varies with each individual, though most are white; some have pale markings, a and a dark variant has been recorded. Males have tufts at their chins, beards that grow with age. Many may make themselves invisible, and use a form of magic very close to alchemy; the ability to transform one substance into another. These unicorns also make excellent guides, an are a friend to elves and centaurs.